A major winter storm unleashed its assault on the Southeast on Sunday, draping southern states with snow and ice as forecasters warned of treacherous travel conditions, flooding and power outages. As snow fell from northeastern Georgia into central North Carolina, winter storm warnings stretched to portions of Tennessee, Kentucky and Virginia. The National Weather Service said significant snowfall accumulations are expected across the southern Appalachians and the adjacent Piedmont of North Carolina and south-central Virginia, with a foot of snow possible through Sunday night. By Sunday afternoon, some cities in North Carolina had received more than 14 inches of snow. The governors of North Carolina and Virginia declared states of emergency and more than 1,700 flights were canceled Sunday across the United States. Nearly half a million people were reported without power in the Carolinas, Virginia, Tennessee, Alabama and Georgia. Duke Energy reported more than 240,000 outages in North Carolina and 170,000 in South Carolina on Sunday afternoon. In Virginia, Appalachian Power was reporting nearly 20,000 outages. In York County, South Carolina, three men who were found unconscious and not breathing inside a home are believed to have died from carbon monoxide poisoning. Officials said they found a generator being worked on inside the home, according to The Associated Press. North Carolina Gov. Roy Cooper, D, urged residents to stay off the roads as the massive winter storm brought the state to standstill Sunday. Emergency crews, including the National Guard, had worked overnight to clear crashes on major interstates, Cooper said at a news conference Sunday. The North Carolina Highway Patrol responded to more than 500 crashes and 1,100 calls for service Sunday and one tractor-trailer ran off a road and into a river, Cooper said. In Virginia, state police responded to more than 140 crashes and dozens of calls for disabled vehicles across western, southern and central Virginia regions impacted by the storm. State Police said the snow was coming down faster than the state crews could keep up with midday Sunday that the interstate 81 in Washington County became impassable. Several tractor-trailers slid off the highway and other vehicles became stuck, police said. “Please stay off the road and delay your travel until the highways are clear,” Virginia State Police spokeswoman Corinne Geller said. Officials said they were concerned about freezing rain in Charlotte, North Carolina, and along the I-85 corridor and in the southern mountains. Ice accumulation was creating hazardous driving conditions and increasing the potential for more power outages. 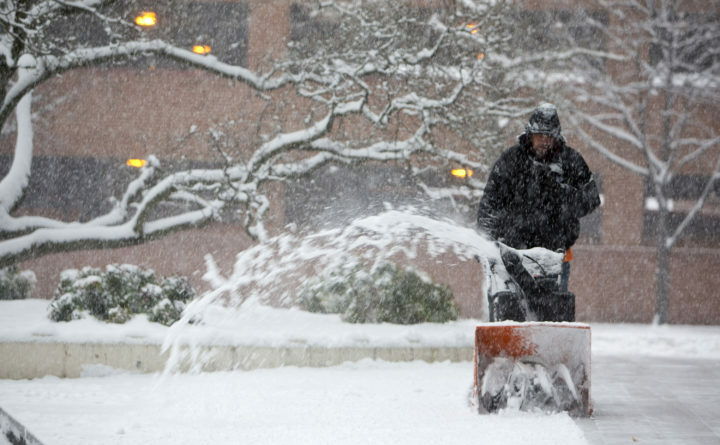 The Washington region is expected to miss the worst of the snow, according to The Washington Post’s Capital Weather Gang, with forecasts predicting anywhere from a few flurries to snow showers closer to the metropolitan area. Some areas to the south, in southern Maryland and toward Fredericksburg, Virginia, could see a few inches of snow. Outside the metropolitan Washington area, forecasts are for ice and snow for the interior Southeast and into portions of the Mid-Atlantic states. Up to eight inches of snow is possible in central and southern Virginia, prompting Virginia Gov. Ralph Northam, D, to declare a state of emergency Saturday. This storm is likely to have a major impact on roadways, as well as air and rail travel through the start of the workweek. As of Sunday afternoon, airports in the storm’s path were experiencing reduced operations, while south of Washington, intercity rail riders faced disruptions in service, which are expected to continue through Tuesday. Amtrak canceled service to areas south of Washington starting Saturday and continuing through Tuesday. Some Northeast Regional trains are operating only north of Washington. The changes affect Auto Train, Silver Meteor, Crescent, Carolinian, Piedmont and Silver Star trains, among others. Amtrak is waiving fees for travelers and said it will accommodate customers on other trains. Airlines, including American and Delta, said travelers can change their flights without penalties for travel to and from the region for trips Sunday and Monday. The severe weather is affecting airports in North Carolina, South Carolina, Tennessee and Virginia. By Sunday afternoon, FlightAware.com reported more than 1,650 Sunday flights had been canceled nationwide, with many of the disruptions in North Carolina. However, that number is expected to rise Sunday afternoon and Monday, with the potential for hundreds of flights to be canceled. Nearly 400 flights Monday were preemptively canceled. Transportation officials in Maryland and Virginia said they were closely monitoring the conditions Sunday. The Maryland Highway Administration said it had crews ready for a chance of wintry weather developing in southern Maryland and the lower Eastern Shore. In Virginia, crews were treating roads Sunday in southside, southwest and central Virginia, while officials said crews are ready to treat roads in northern Virginia if the storm makes a shift north.